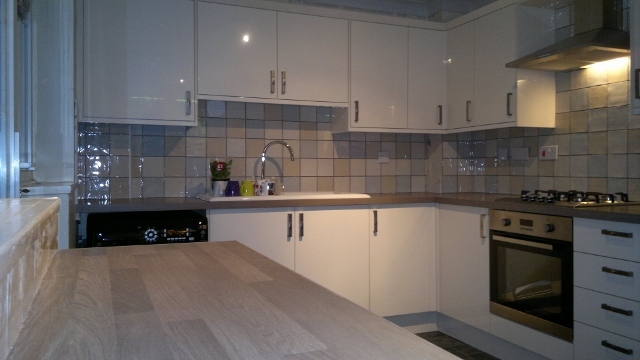 This is the Greenwich, a low cost kitchen which has recently become available in a gloss finish. Proving that with a professional fitter you don't have to spend a fortune to get a superb look. Worktop featued is an oak block laminate. The Tewkesbury is fast becoming one of the most popular choices as it has a classic shaker styling which can be made to feel contemporary or traditional. The solid wood doors in either a painted finish or natural have a superior quality look. 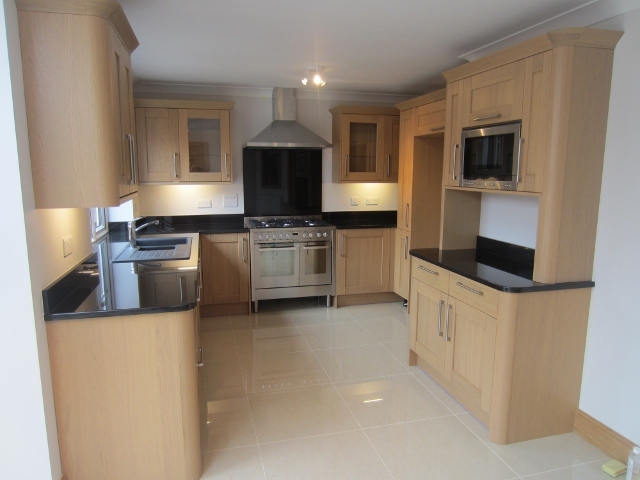 This is in Oak with black quartz worktops, part of our ongoing work with Chater Homes. 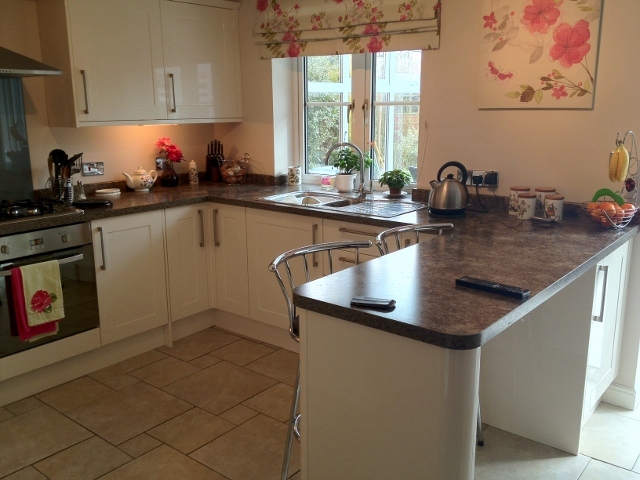 This Is the Tewkesbury Skye with solid oak worktops. The Kitchen an dining area were knocked through creating an unsual and interesting room. 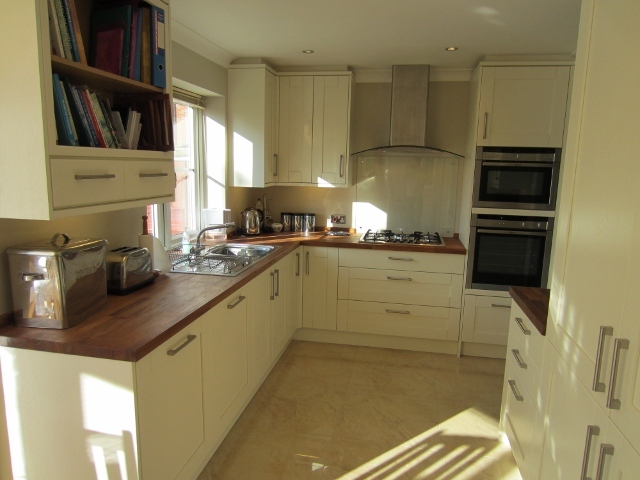 This is the Tewkesbury in White with solid Iroko worktops. The client wanted extra storage but creating extra floorspace was not an option, so they chose extra tall wall units. The storage unit in the front of the picture wasn't available in extra tall so this was created using end panels and making drawers. The finished effect is stunning. If you have the room an Island gives extra workspace, with the benefit of extra storage and a seating area behind. 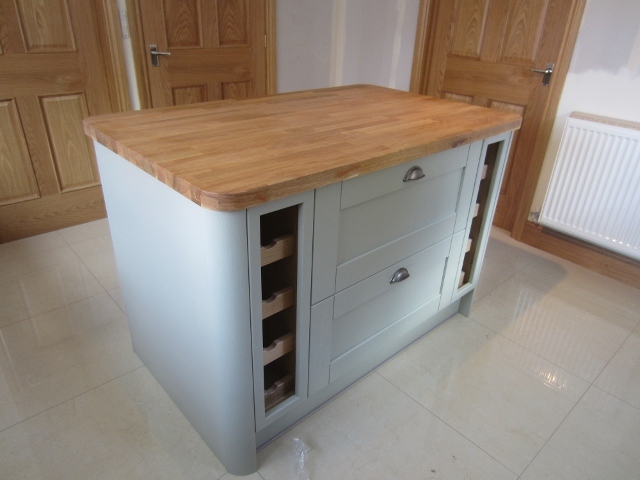 This is the tewkesbury Skye with a solid oak worktop, also part of the kitchen below. The Tewkesbury Skye is a solid ash door with a painted finish. 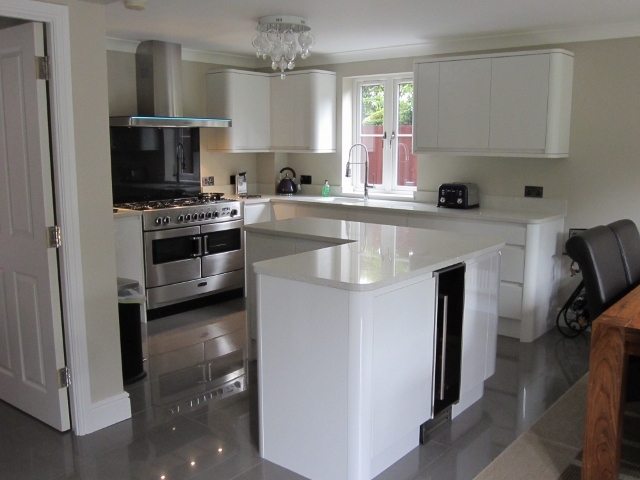 A fabulous finish with the white flecked quartz worktop. This kitchen fitted as part of a new project with Chater Homes. 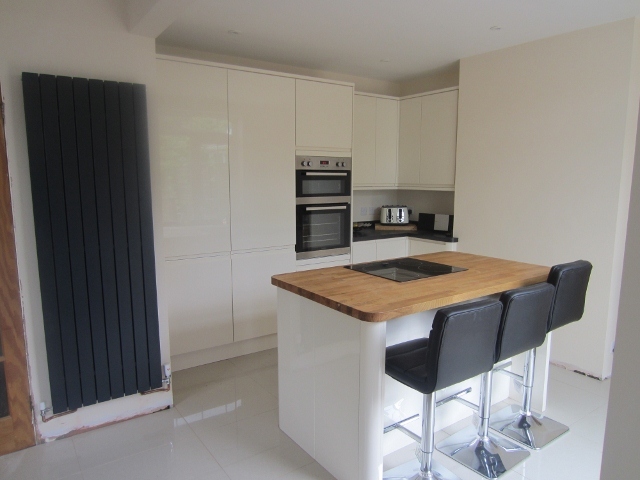 High Gloss Black with White worktops. 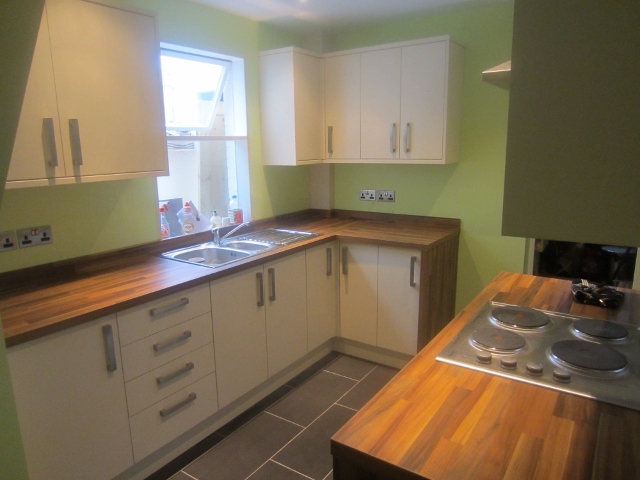 A classic combination of colours throughout time, this kitchen was originally 2 rooms knocked into one spacious area. Gloss Cream Integrated handle with Iroko Laminate worktops. Sleek and Modern, Super stylish and practical. 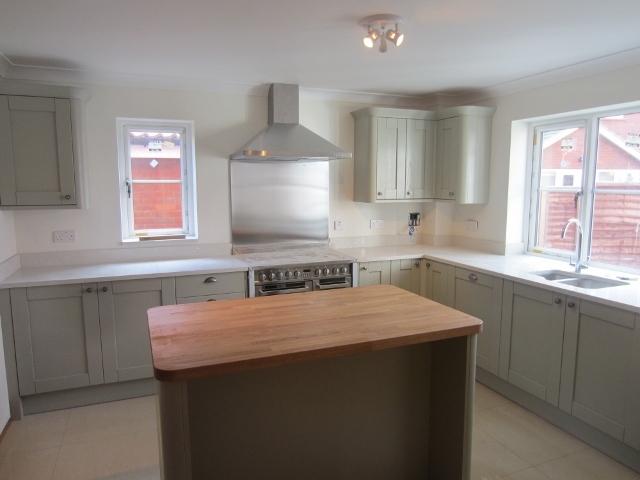 Glendevon High Gloss Cream and Flint Grey with solid oak worktops. This colour combination works so well. 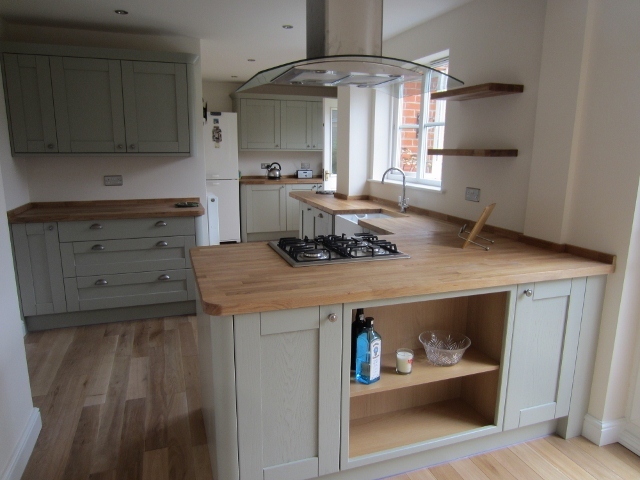 The muted tones of the cupboard doors along with the oak worktops makes the space feel warm and inviting. 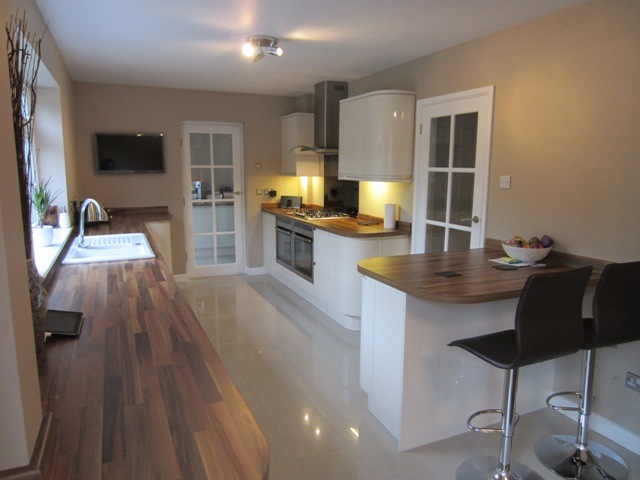 This kitchen was originally 3 rooms all opened up to make the open plan space the client desired. Greenwich Cream with Iroko laminate worktops. Using the same worktop to create and end panel has given this simple style a contemporary edge. Cream Gloss Integrated Handle with solid oak worktops. This kitchen really shows how you can maximise storage space with the full height cupboards. The solid pine worktop adds warmth and texture. The island with breakfast bar underneath makes great extra seating. For those who dare to be different! 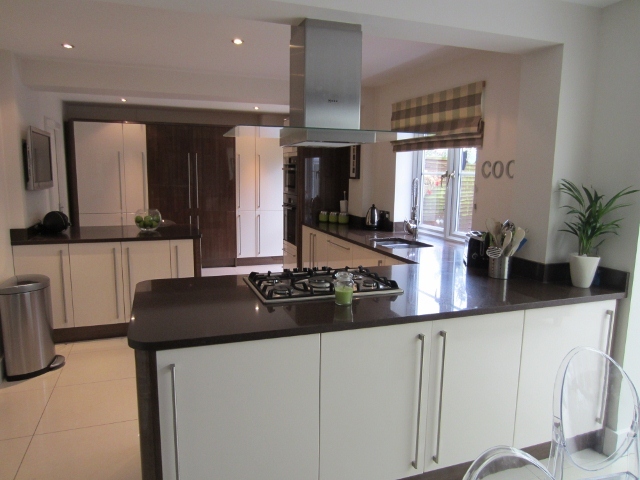 This is a combination of the Glendevon High Gloss Cream and Dark Oak with brown Quartz worktops. This kitchen was originally 3 seperate rooms and part of a garage, all knocked through to create one open plan kitchen/ dining and living area. Gloss White Integrated Handle with white Quartz worktops. The L Shaped island incorporating a wine cooler adds something different and the stainless steel range cooker really gives a focal point. 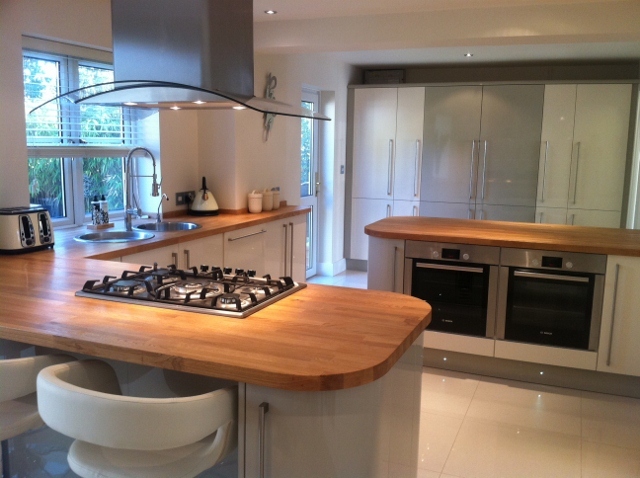 Burford High Gloss Cream with Jamocha laminate worktops. A modern twist on a classic shaker style kitchen.